Join us on the second Friday evening of each month from May through October 2018. Various shops and businesses in the Arts District will be hosting visiting artists and serving refreshments from 5-7 pm. Some artists’ work will remain on display through the weekend or beyond. Others are one-night only. Visit our Facebook page “Beekman Street Arts District” for a list of participating shop hosts and visiting artists. 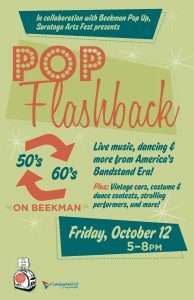 Friday October 12th, the Arts District and Saratoga ArtsFest present “Pop Flashback,” a look back at the 50’s and 60’s. Merchants and visitors are encouraged to dress in vintage clothing and enjoy live music, dance and vintage cars along with several art openings on Beekman Street. Look for balloons and signs at particpating venues!